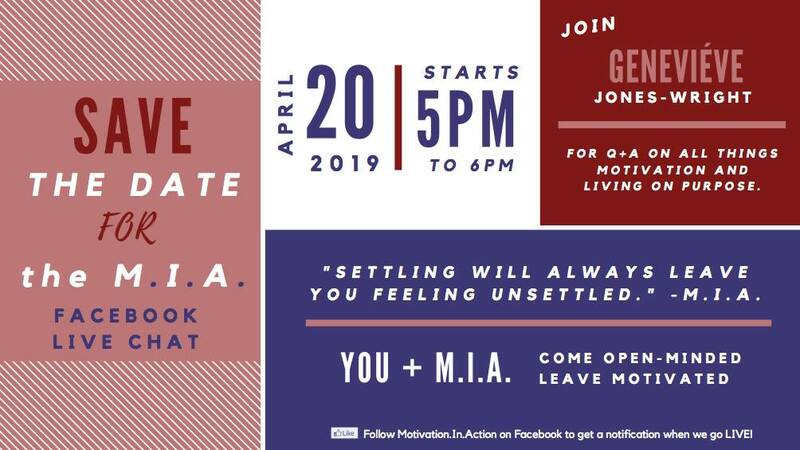 Join Geneviéve Jones-Wright for our first ever Motivation.In.Action Facebook Live chat on Saturday, April 20th, from 5-6pm. This will be a free-flowing and relaxed Q+A conversation about motivation and living your purpose. Join us to work through topics like settling for average, not being paralyzed by fear, and taking the first steps to writing your own story. Bring your questions, bring a friend, and join us for the first of many M.I.A. chats. RSVP here via Facebook. We’ll keep you posted when we’re about 5 minutes from starting. Then just look for the notification we’ve gone live and come join us!